What is 3rd Party Certification? 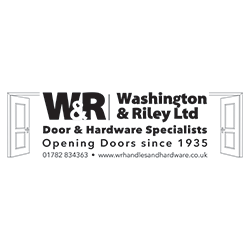 Washington & Riley Ltd are a doorset supplier and architectural hardware specialist, based in Stoke on Trent, Staffordshire established in 1935. Washington & Riley Ltd supplies to contractors, local authorities, healthcare trusts & PFI’s across the UK and also offers a fitting service. Washington & Riley can supply doors that are tested and certified to meet Secured by Design requirements when requested. They can supply doorsets to meet a variety of performance characteristics, including FD30, FD60 and FD120 fire doorsets. Washington & Riley’s aim is to supply high quality doors with short lead times, and to offer value for money with a professional, friendly, service. Scopes of certification are only valid when listed on the Bluesky Certification website. Full details of the scope of certification should be confirmed by requesting copies of the scope(s) referenced above from the certified company. The certified company remains solely liable for its products and services and Bluesky Certification does not accept any liability for any product or service offered or supplied by either the certified company, its customers or any other party. Whilst every effort is made to ensure the accuracy of this scope of certification, Bluesky Certification cannot accept liability for any loss or damage arising from the use of the scope. Where reports are not authored by Bluesky Certification, Bluesky Certification does not take any responsibility for any assessment of performance that have been made by the author of the report and full liability for any such assessments remains with the report author. Bluesky Certification is a trading name of and content is copyright to Calibso Ltd, company no, 09792077, 20 - 22 Wenlock Road, N1 7GU. Web design by Frostwork.